Another British fighter described him as a "lovely lad" who was "excited to be there". In a video recorded by the YPG to be released in the event of his death, he said: "I came here of my own free will, knowing the risks and consequences that can follow. "Greetings to all my family and friends, if unfortunately you are seeing this. Biji Kurdistan (long live Kurdistan)." Kurdish representatives in London said Mr Hall was killed while "clearing and dismantling mines". Kevin Benton, an ex-soldier and British volunteer who met Mr Hall in Syria, said: "He was so willing to learn, always asking questions and taking everything in. He wanted to stop Isis." There have been a series of deaths in recent months - Mr Hall is the fourth British volunteer fighter killed in the Raqqa operation since July. He travelled to Iraq then crossed the border into Syria, according to friends, where he attended the training academy of the Kurdish armed units the YPG, known as the People's Protection Units. "I spoke to him last week just to see how he was doing, he seemed happy," Mr Benton said. "He wasn't a soldier before he came to Syria, but he was professional and was really keen to learn. He was a very popular guy, everyone liked him"
"He wanted to be at the front, and wanted to be right where the action was, and he wasn't scared to go. A statement from the Kurdish Solidarity Campaign in the UK said: "Our deepest sympathies are with the family and friends of Ollie Hall at this time. "Ollie's family have requested that they are left alone by the media for now to be able to process this shocking and tragic news." 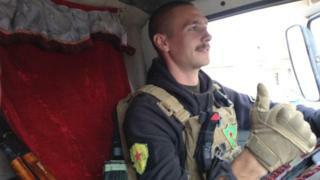 Mr Hall's death brings the total number of Britons killed while fighting for the YPG in Syria to seven. Jac Holmes: A 24-year-old former IT worker from Bournemouth, Mr Holmes died while attempting to clear landmines in the city of Raqqa. Mehmet Aksoy: The 32-year-old British film-maker from London was killed in September 2017, after travelling to Syria in June. Luke Rutter: The 22-year-old from Birkenhead, in Merseyside, was killed in June 2017 after his regiment were ambushed by IS forces in Raqqa. Ryan Lock: A 20-year-old former chef from Chichester, Mr Lock died in December 2016 after turning his gun on himself to avoid capture. Dean Carl Evans: The 22-year-old from Reading died in July 2016, while fighting in the city of Manjib. Konstandinos Erik Scurfield: The 25-year-old ex-Royal Marine, from South Yorkshire, died in 2015 to become the first Briton killed while fighting against IS in Syria.